The holiday season can give us the perfect opportunity to work on DIY projects. Making your own homebrew Christmas decorations are a great way to make use of your tinkering talents. We have already covered 12 great Raspberry Pi Christmas Projects 12 Raspberry Pi Christmas Projects You Can Make in a Day 12 Raspberry Pi Christmas Projects You Can Make in a Day It's that time of year when the DIY community really shines: Christmas! These awesome Pi projects can all be made in a day! Read More , along with ideas for Recycled DIY Christmas Decorations 10 Christmas Decorations You Can Make From Recycled Materials 10 Christmas Decorations You Can Make From Recycled Materials Forget buying new decorations this Christmas. Make your own! With recycled materials, you can save money and the environment. Read More , to give your home the personal touch this Christmas. This article will give you some fun ideas for DIY Christmas themed electronics builds, most of which come in at under $5, making it perfect for people not wanting to ruin their budget this Christmas 10 Ways to Ruin Your Budget This Christmas 10 Ways to Ruin Your Budget This Christmas Christmas can be a difficult time of the year for your budget. Stick to these tips to make good financial decisions this holiday season. Read More . The first idea on our list today combines budget minded thinking with simple design to make something that looks fantastic. This DIY Christmas star is big enough to really make an impression, and looks a lot more professional than the sum of its parts. The simple design is explained by Crystal at littlebitfunky.com, and uses cheap wooden rulers to create the star shape, which makes the frame for the lights to wrap around. Best of all? This build comes in at under $5. This idea could be taken a step further by using RGB LED strips 22 Ways to Light Up Your Life With RGB LED Strips 22 Ways to Light Up Your Life With RGB LED Strips You can buy five meters of RGB LEDs strip lighting for under $10 -- so here's some great project ideas to use them around your home. Read More instead of shop bought fairy lights, and using an Arduino board to control them. Making your own mini Christmas jukebox is simpler than you think, especially if you already own an Arduino. This simple circuit design from YouTuber Andy Tran uses simple and cheap components which cost only cents (and are usually found in Arduino Starter Kits) to inject some Christmas cheer into the vicinity! Alongside the buzzer, an LED flashes in time with the music, with three further LEDs lighting up in sequence to add to the effect. The music is taken care of by converting MIDI files into data compatible with the Arduino tone library, using a web tool linked in the video description. A detailed diagram is also linked to help you put the circuit together. 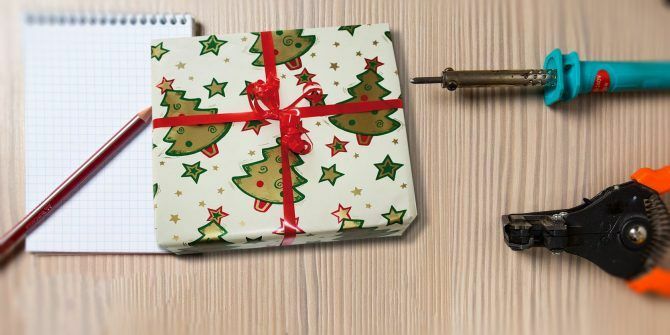 This can be a perfect beginner project for new makers, and Christmas is the perfect time to give an Arduino as a gift 10 Gift Ideas for the Arduino Tinkerer in Your Life 10 Gift Ideas for the Arduino Tinkerer in Your Life Buying a gift for the Arduino lover in your life? Here are some awesome gift ideas: books, kits, project components, and more! Read More ! Let the bells ring out for the Christmas hits! In this case we are talking blog hits, and Instructables user alex_weber’s Arduino-powered bell ringer! This ingenious build uses an Arduino Uno board (though you could use almost any other board that is compatible with the Arduino IDE) and a servo to ring a Christmas bell every time the maker’s blog is visited. The build is simple enough to be attempted by beginners and more seasoned hackers alike, and the code is a blend of C, Python, and PHP. The build doesn’t just have to stop at blog visits either, by using IFTTT integration you can use almost anything to trigger your bell. We used the arrival of a new email to trigger our LED strips in our Wi-Fi Controlled PC Case Lighting Add Wi-Fi Controlled Lighting to Your Computer With NodeMCU Add Wi-Fi Controlled Lighting to Your Computer With NodeMCU Learn how to liven up your computer case by building a DIY Wi-Fi-controlled Neopixel system with NodeMCU and some basic programming. Read More article. The same theory can be applied here. What better thing than your own heralding bell to inflate your ego over your witty Facebook posts? Next up on our list is the Tweetball. This build integrates DIY tech into a bauble designed to be hung from a tree, or left somewhere prominent for your guests to see. An LCD screen is powered by a Wi-Fi-enabled Arduino to display messages from Twitter. The screen in this build is a 20×4 LCD, which are both very cheap and easy to use. For a full rundown of display options available, check out our Arduino display guide 6 Displays to Output Data From Your Arduino 6 Displays to Output Data From Your Arduino In this article we will take you through the different types of display available, where to get them, and how to set them up. Read More . 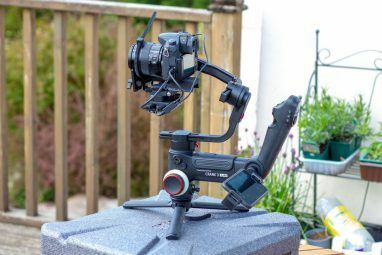 The build was designed and built by Instructables user Gelotology, who provides a detailed guide to both the hardware and software design. The Wi-Fi element of this build is provided using a Sparkfun WiFly module. 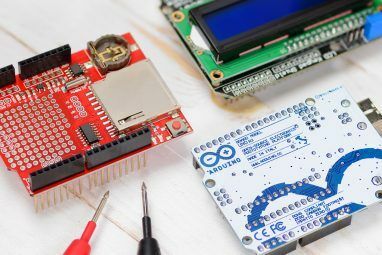 One way to cut back the cost of this build would be to drop the Arduino and Wi-Fi shield, and use a NodeMCU Meet the Arduino Killer: ESP8266 Meet the Arduino Killer: ESP8266 What if I told you a there's an Arduino-compatible dev board with built-in Wi-Fi for less than $10? Well, there is. 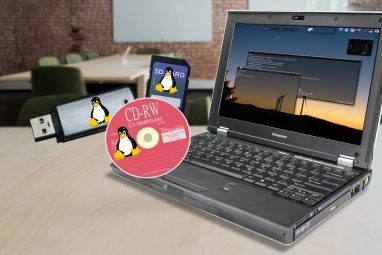 Read More instead, as it is compatible with the Arduino IDE and comes with Wi-Fi connectivity built in. Soldering is amongst the most important skills any budding maker can learn. There are great guides to getting started with a soldering iron Learn How to Solder, with These Simple Tips and Projects Learn How to Solder, with These Simple Tips and Projects Are you a little intimidated by the thought of a hot iron and molten metal? If you want to start working with electronics, you're going to need to learn to solder. Let us help. Read More , though nothing beats hands on practice on a small project. Enter, the PCB Christmas tree kit! These festively themed kits combine two Christmas tree shaped PCBs along with all of the components needed to create a futuristic sparkling decoration. The kits are available for as little as $3.50 and come with all the components required to get started. These kits sometimes come with difficult to follow instructions, but jlonglaw at Hackaday has you covered with his in-depth guide to putting these trees together. This last one is still fairly low budget, but ups the complexity significantly. We think Last Christmas is less of a song and more a form of aural torture, and Instructables user awall99 clearly agrees. What better thing to do with this information than create the ultimate temptation button for passing evil doers? This build combines a cheap Ikea frame with two homemade PCBs to take care of the counter and MP3 playback respectively. While the components for this DIY Christmas project are all cheap in their own right, this build might be a little cost prohibitive to those not already making their own circuit boards! Also, as this guide doesn’t go through the components on the boards in detail, you’ll need to use your own smarts to get it up and running. A much easier way to build something similar to this would be to keep the frame design the same, and use a Raspberry Pi as the brains of the operation. We did something very similar when we taught you how to Play Your Own Theme Tune When You Enter the Room Play Your Own Theme Tune When You Enter the Room With Raspberry Pi Play Your Own Theme Tune When You Enter the Room With Raspberry Pi Have you ever wanted to arrive home to a personal welcome? In this simple Raspberry Pi project we'll use a reed switch to trigger a tune when a door is opened. Read More . With a little modification, the picture frame could be fully Pi powered, and you can practice your evil grin as you watch people press the button. Christmas doesn’t just have to be about Christmas music The 30 Best Christmas Songs to Stream Over the Holidays The 30 Best Christmas Songs to Stream Over the Holidays Everybody likes a good Christmas song. The problem is finding the good ones in amongst the bad. In this article we find the 30 best Christmas songs available to stream right now. Read More and your favorite seasonal movies The 10 Best Christmas Movies on Netflix to Watch This Year The 10 Best Christmas Movies on Netflix to Watch This Year Tired of digging through Netflix for the good stuff? Here are the best Christmas movies on Netflix to watch this holiday season. Read More . It’s also a time to take some time for your hobbies and interests. Whether you plan to 3D print your Christmas 20 3D Printing Ideas You Can Use This Christmas 20 3D Printing Ideas You Can Use This Christmas With 3D printing being the future, and Christmas right around the corner, why not combine them both with these awesome Christmas 3D printing ideas? Read More this year, or you just prefer to give your computer a little Christmas cheer How to Add a Christmas Theme to Windows 10 How to Add a Christmas Theme to Windows 10 Christmas is coming! To help get you into the festive spirit, let us show you how you can customize your Windows 10 system for the holidays. Read More , we hope you have a great holiday! Are you planning on building your own high tech Christmas this year? Do you have an epic DIY Christmas build you want to show off? Let us know in the comment section below! Explore more about: Christmas, Electronics. This article is stupid. 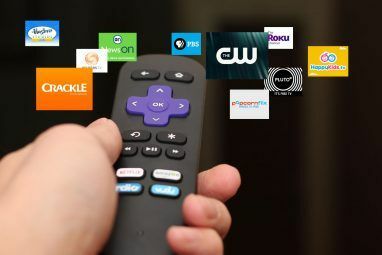 The cost of the fire tv atick and all the accessories you suggest buying to turn it into the fire tv box, cost more than the fire tv box itself.